From the 11th to the 15th July 2018, I had the great pleasure of being part of a small group of Classics teachers attending the Teachers’ Course at the British School at Athens. There were seven of us, we came from a variety of different educational contexts (independent, state, faith school), and we taught across various subjects (Ancient History, Classical Civilisation, the ancient languages) at GCSE and A level. We were here to deepen our knowledge of ancient Athens from the archaic through to the Roman period, and for the next four days, we were privileged to receive a series of lectures and guided tours, conducted by experts in the fields of archaeology, art history and philology. 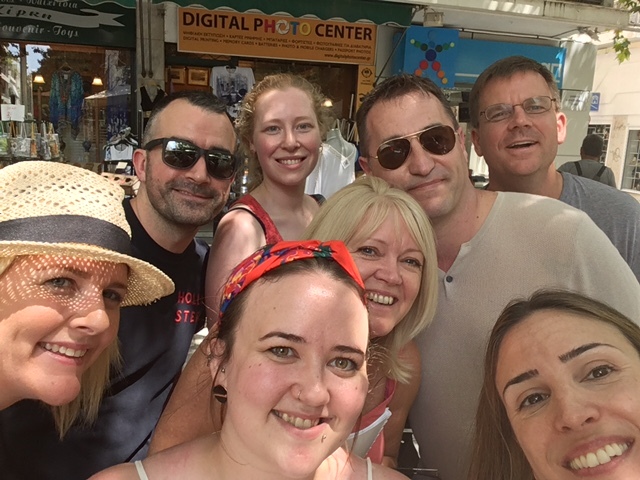 We arrived on various flights from the UK on Wednesday 11th, and after assembling in our hotel lobby and introducing ourselves, we proceeded to the Plaka district, where we dined in a rooftop restaurant, under a starlit sky, beneath the Acropolis. It was a fantastic start to our visit. Our course started in earnest early the next morning as we headed to the Acropolis, just a few minutes walk from our hotel. Our guide was Dr Chryssanthi Papadopopolou, Assistant Director of the BSA. 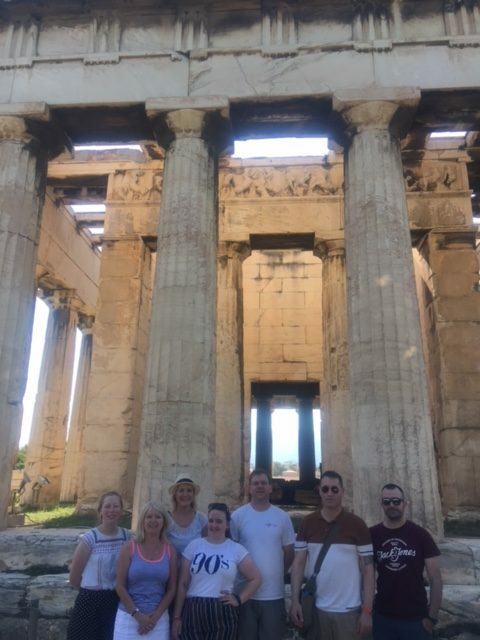 Over the course of the morning, we were given an in-depth guide to the Parthenon, the Erectheion and to the other buildings on the Acropolis. By the end of our tour, we had learnt much about the Periclean building programme. In the afternoon, we fled the heat of the Acropolis to the cool confines of the Acropolis Museum, where we looked at a selection of artefacts, including the Parthenon frieze and the korai, the free-standing statues of young women, dating from the archaic period. Our day ended in the Kerameikos, where we learned about Athenian funeral practices and the route of the Panathenaia. 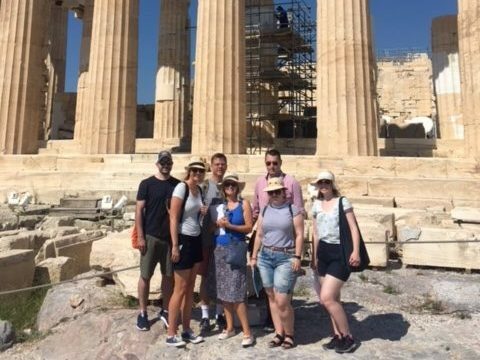 Friday morning took us to the ancient Athenian Agora and the impressive Doric Temple of Hephaestus, followed by an afternoon at the National Archaeological Museum. For me the undoubted highlight of the exhibits were the astonishing array of Bronze Age Mycenean grave goods, fashioned from gold, which were exquisite in their finely-wrought construction. We also received a fascinating tour of selected items of pottery by Dr Karim Arafat. The day ended with a talk on Linear B at the British School, by the Director, Professor John Bennet. Linear B continues to fascinate and frustrate in equal measures, and remains something to which I would like to devote more time (teaching permitting!). 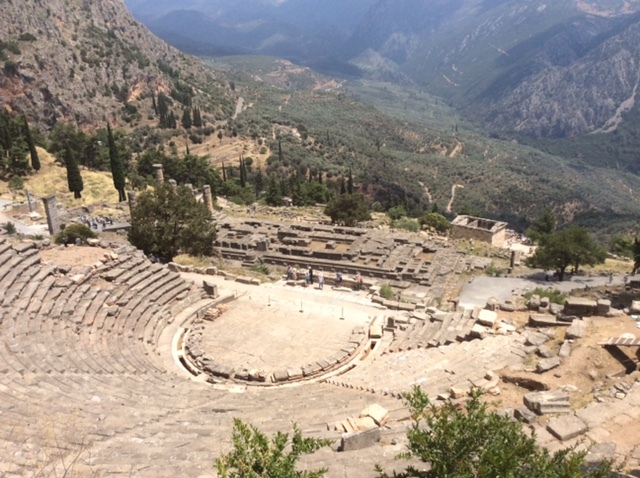 On Saturday we took a coach to Delphi, three hours distant from Athens, which the group had been eagerly anticipating. It did not disappoint. 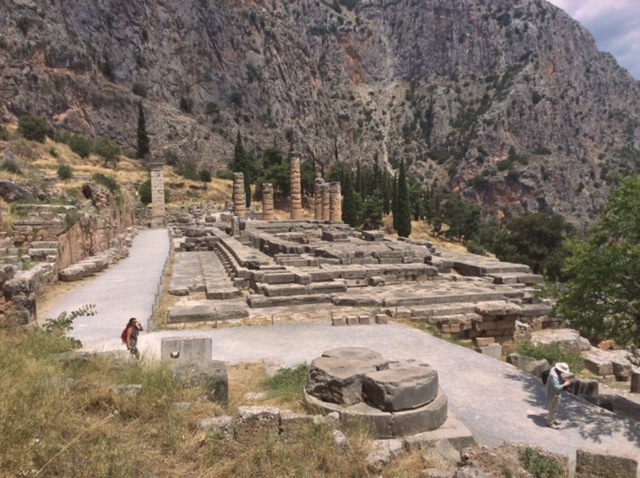 The site was astonishing, both well-preserved and blessed with a stunning location in the mountains of central Greece, and is undoubtedly one of the best ancient sites that I have ever visited. We had several hours there, and were also able to visit the site museum, which included many fine artefacts, including the famous bronze Charioteer. Our final morning was spent at Piraeus, the ancient harbour of Athens, learning about the role of the Athenian navy, as well as being able to wander the largely empty Piraeus museum (surprisingly empty: the museum had many fine bronze pieces). By lunchtime we were done. With farewells, and promises to stay in touch, we departed for the airport. I can unreservedly recommend this course, as it provided some really useful material that can be used effectively in my teaching. I was provided with a financial bursary by the Classical Association, which was incredibly helpful. An unforgettable experience, and a reminder, if any were really needed, of the richness of the Classical world and the enthusiasm and expertise of those who both study and teach it.